After recently undertaking a journey to walk -- not fly -- across the United States in the "Grounded" storyline and reconnect with the country and everyday Americans, Superman appears to be taking another step that could have major implications for his national identity: in Action Comics #900......Superman announces that he is going to give up his U.S. citizenship. Despite very literally being an alien immigrant, Superman has long been seen as a patriotic symbol of "truth, justice, and the American way," from his embrace of traditional American ideals to the iconic red and blue of his costume. What it means to stand for the "American way" is an increasingly complicated thing, however, both in the real world and in superhero comics, whose storylines have increasingly seemed to mirror current events and deal with moral and political complexities rather than simple black and white morality. The key scene takes place in "The Incident," a short story in Action Comics #900 written by David S. Goyer with art by Miguel Sepulveda. In it, Superman consults with the President's national security advisor, who is incensed that Superman appeared in Tehran to non-violently support the protesters demonstrating against the Iranian regime, no doubt an analogue for the recent real-life protests in the Middle East. However, since Superman is viewed as an American icon in the DC Universe as well as our own, the Iranian government has construed his actions as the will of the American President, and indeed, an act of war. 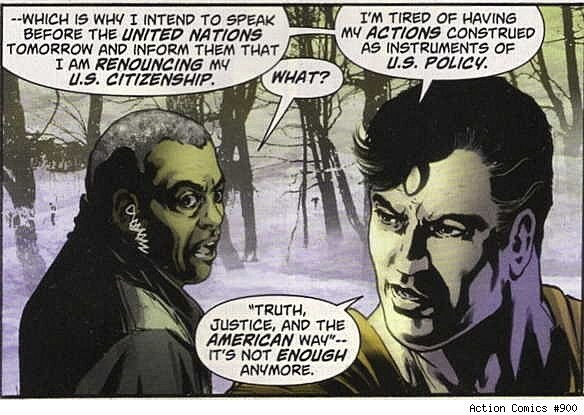 Superman replies that it was foolish to think that his actions would not reflect politically on the American government, and that he therefore plans to renounce his American citizenship at the United Nations the next day -- and to continue working as a superhero from a more global than national perspective. From a "realistic" standpoint it makes sense; it would indeed be impossible for a nigh-omnipotent being ideologically aligned with America to intercede against injustice beyond American borders without creating enormous political fallout for the U.S. government. While this wouldn't be this first time a profoundly American comic book icon disassociated himself from his national identity -- remember when Captain America became Nomad? -- this could be a very significant turning point for Superman if its implications carry over into other storylines. Indeed, simply saying that "truth, justice and the American way [is] not enough anymore" is a pretty startling statement from the one man who has always represented those values the most. It doesn't seem that he's abandoning those values, however, only trying to implement them on a larger scale and divorce himself from the political complexities of nationalism. Superman also says that he believes he has been thinking "too small," that the world is "too connected" for him to limit himself with a purely national identity. As an alien born on another planet, after all, he "can't help but see the bigger picture." Do you think the shift to a more global role makes sense for Superman? If he really is going to renounce his U.S. citizenship in order to function as a more international figure, how do you think it will affect the character?